HARRISBURG, Pa., Oct. 21, 2014 /PRNewswire/ -- A Harvard School of Dental Medicine symposium recently featured data from United Concordia Dental's landmark study as compelling evidence on the costly impact of poor oral health on overall wellness. "This event was an ideal venue in which to share our new data – data that shows significant medical savings and reduced hospitalizations are possible when people with more than one chronic illness receive and maintain treatment for gum disease," said James Bramson, D.D.S, chief dental officer, United Concordia Dental. The "Put Your Money Where Your Mouth Is: The Economic Imperative of Oral Health" event featured a panel of experts moderated by Marjorie Jeffcoat, D.M.D., dean emeritus of the University of Pennsylvania School of Dental Medicine and lead researcher on the dental wellness study. 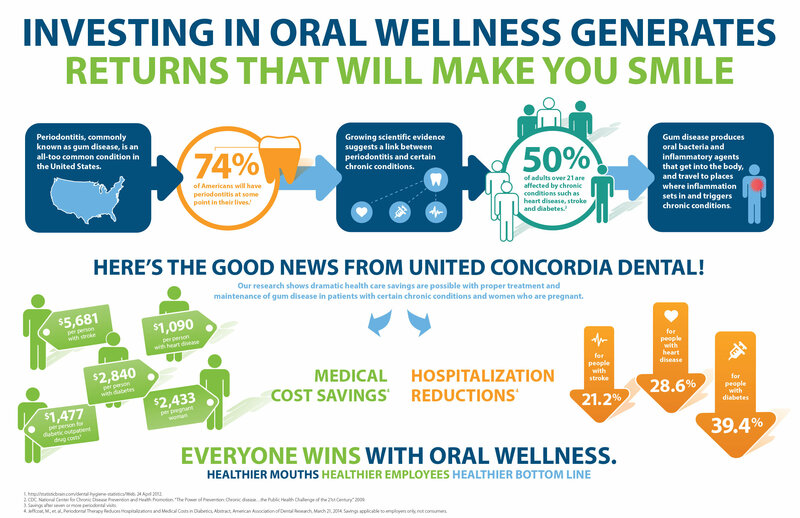 United Concordia Dental's findings, published by the American Journal of Preventive Medicine, have been a driving force behind the development of consumer-centric products and services focused on promoting oral wellness. A network sharing agreement with Dental Network of America (DNoA) and DenteMax has made United Concordia Dental's network one of the largest in the nation with nearly 102,900 unique dentists and more than 283,100 access points. An award-winning app, Chomper Chums®, for children ages 4-11, makes oral health fun by teaching the importance of proper brushing, flossing and rinsing, as well as the benefits of good nutrition. More than 600,000 new members in the company's first year focused on oral health and overall wellness. Enhanced outreach and support efforts, including hiring dental wellness coaches, to help consumers better understand the important connection between oral and overall wellness. "We are working diligently to ensure United Concordia Dental continues to lead the industry's evolution to dental wellness," said F.G. "Chip" Merkel, president and chief operating officer, United Concordia Dental. "It's our mission to advocate for and enhance the oral health and overall well-being of those we serve, while efficiently managing their health care dollars." For more information about United Concordia Dental, visit UnitedConcordia.com, or watch this video.